The New Year’s parties are done with, you’ve decided against buying that gym membership come January 1st, and it’s generally a miserable time until spring comes. However, this hangover you’re getting from the dark and despising going outside can be fixed with a hot drink and a fun weekend of poker. The TonyBet Poker room, known as the best place for some OFC fun with a bit of traditional poker mixed in, has prepared something that could become your go-to plan when you need that extra kick. Here’s the deal: monthly weekend tournaments that will feature a different type of tournament every team, drawn together with awesome additional prizes on top of the GTDs. Can’t wait for it to start? You don’t have to: the first series is kicking off on 21st of January. 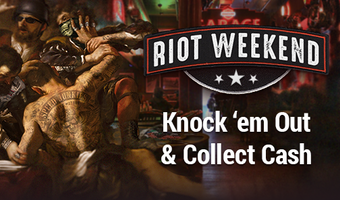 Let’s hear it for the Riot Weekend! Get ready for more than 40 Super Knockout tournaments taking place on Saturday and Sunday, throughout which TonyBet Poker will give away thousands of €€€ in GTDs. The tournaments will be running every hour from 10:00 am GMT, and every half an hour for the rest of the evening after 3:00 pm GMT. All kinds of players will find their niche, as the lowest buy-in is €3 in the Riot Weekend Rookie tournaments going up to €100 in the Riot Weekend Crown, so prepare to collect your GTDs – and, of course, there’s more. These are the kind of games where your poker skills are just as important as, well, your arse-kicking abilities. The more players you manage to kick out, the better our prize for you will be in the super special Head Count leaderboard where the top 10 brawlers will be awarded bounty in cash. However, even if you don’t make it to the very top, you’re still getting rewarded for each head! Are you ready for this? Well, let’s hope you’re not afraid of the challenge! If you’re not, the tournaments start on Saturday and will run throughout the weekend, so you can either start early or sleep in & cash in.